This exhibition is drawn from the Martha Hesse Dolan and Robert E. Dolan Collection. Country is spoken about in the same way non-Aboriginal people may talk about their living human relatives. Aboriginal people cry about country, they worry about country, they listen to country, they visit country and long for country. This exhibition presents a concise selection of paintings by Aboriginal Australian female artists, drawn from the collection of Martha Hesse Dolan and Robert E. Dolan. 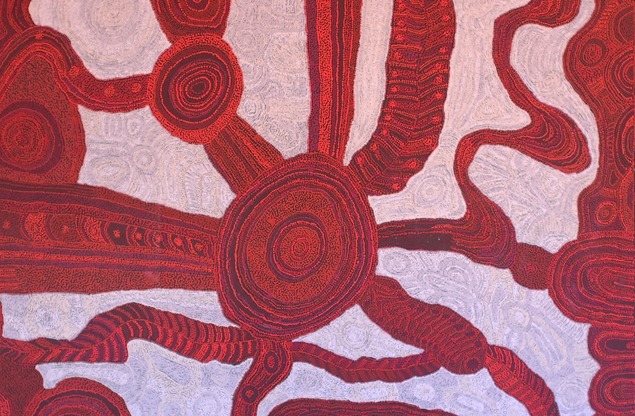 Inspired by the 2015 exhibition, No Boundaries: Aboriginal Australian Contemporary Abstract Painting, which was organized by the Nevada Museum of Art, the Nevada-based couple began researching Aboriginal Australian art, and acquiring work by female artists, as well as collaborative work or group projects. The Indigenous people of Australia are inextricably bound to their land. Although the artists in this exhibition are from diverse communities across Australia, each shares a commitment and responsibility to country. For Aboriginal Australian people, country comprises the land, sea, sky, and everything contained therein. Each artist engages with country in various ways through their work. The artists in this exhibition paint the natural features of their country in a non-representational style that enables the artists to keep secret and sacred elements hidden from uninitiated viewers. They depict songlines, also called Dreaming Tracks, which describe the paths taken by the Ancestors as they created the world during the Dreaming. The Dreaming encodes the location of essential waterholes and food sources into stories, dances, and songs that artists translate into visual form. Aboriginal people who have memorized the songlines can navigate across Australia by following the landmarks made by the Ancestors—such as hills, valleys and watercourses—that are described in the songs. This is called “singing up country,” which is also considered a sacred duty that is necessary to keep the world in existence. The Dreaming and the paintings arising from it are thus both systems of geography and of belief.